Thanks to the much better interface of photo captioning I’ve adopted since my WordPress update awhile back, this one can literally be handled with photos, captions, and text. You get all three in one gooey, chewy, oh-so-sweet and ooo-ey mishmash of photos that will basically take you through my day – except for the tired feet. This was the scene when I arrived about 10:45. 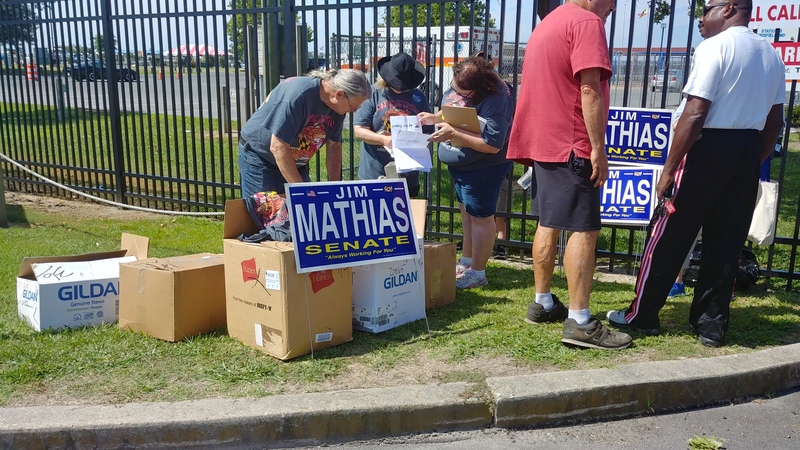 Local supporters of Jom Mathias were coordinating their efforts at the gate, Quite a few of those shirts found their way onto people at the event. I Tweeted this next photo the day of, as I recall. I wonder who pulled the strings to get Jim Mathias the plum spot up front. If you were coming this way to a corporate tent or the Crab Trap, you had to walk by. Inside, people were getting set for the show to begin. This is almost like a class photo. I’m sure 20 years from now, these runners will be looking at this, laughing, and wondering whatever happened to some of these nice folks. Runners assigned here had a LONG way to travel. The Crab Trap is a relatively new idea. It’s sort of a cross between a corporate tent and an after-party, and for a $20 premium you could enjoy the day from there. Before I get too much farther, I could kick myself for not getting a photo of those doing the cooking. They are the heroes of the day and don’t get thanked enough for a hot, nearly thankless task for which they still willingly volunteer. You know, it’s a good thing this truly isn’t up for election. Could you imagine a split ticket winning that one? 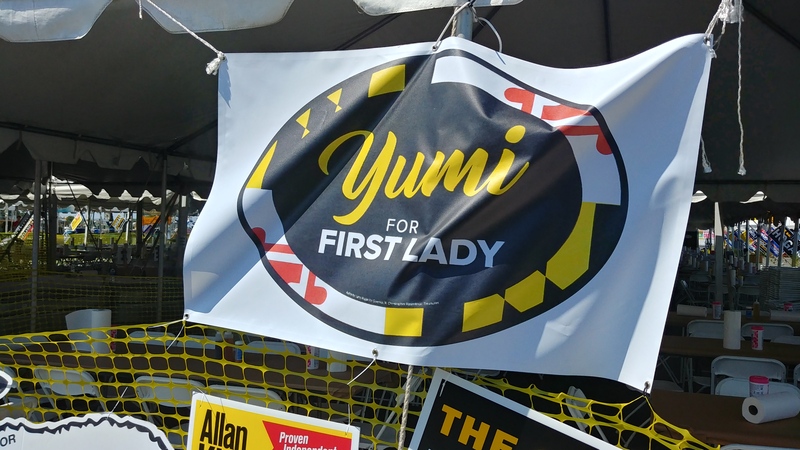 I didn’t see Yumi at Tawes (not that I would necessarily be able to pick her out in the crowd) but I saw her husband make the rounds. More on that in a bit. Luckily it was still before 11 when I took this – whoever was in charge of slapping up signs had a lot to do! As the 11:00 hour rolled in, people were still busy getting ready for the crowds. 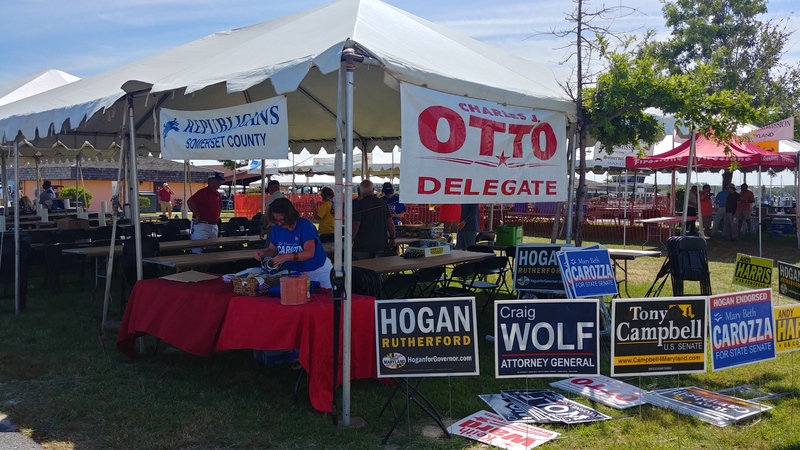 The Somerset County GOP was getting their tent space set up with plenty of signs and stickers. It was at that point I realized that even 13-year veterans can make rookie mistakes: I left my box bottom in the car. 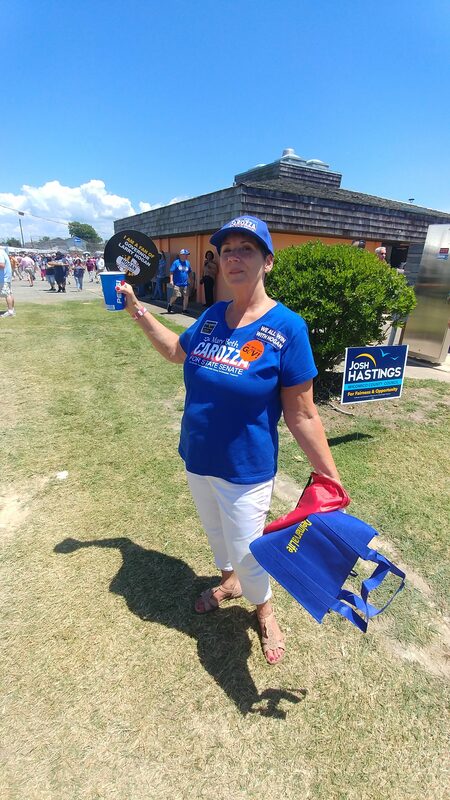 A box bottom is a key component for Tawes because it serves as your food tray and (for some) a place to festoon with campaign stickers. So on my way out I got a shirt. First time ever. They had a good selection of shirts this year. I picked out a nice blue one. By the time I trudged my way back in after a good half-mile round trip, I saw that food was already being served. These seem like long lines, but most of them went fast and I have seen longer. I think having the runners has cut down on wait time. 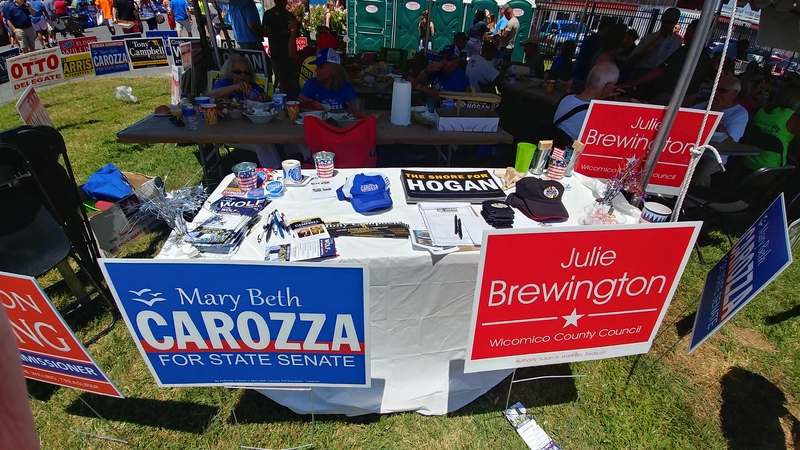 So I found my way to the Somerset GOP tent and crashed their party. While I was there, Lieutenant Governor Boyd Rutherford was already making the rounds. I took a few photos but with a bright background from a tent in the shadows they didn’t work well. After I finished eating, I spied these two guys – part of a modest contingent backing unaffiliated U.S. Senate hopeful Neal Simon. They were circulating petitions at Tawes to get Simon on the ballot. Backers of U.S. Senate hopeful Neal Simon fish for petition signatures. Now this photo is nowhere near as important as a photo Neal put out Wednesday with the aforementioned Governor Hogan. And I’ll get to that in a little bit, too. But first I ran into a guy who’s in the catbird seat – my Delegate, Carl Anderton. With no election opposition, Delegate Carl Anderton can afford to give the thumbs-up. He was just the first of a whole host of political and semi-political folks I got to chat with over the next 3 hours or so as I wandered around. There are some people who take “all you can eat crabs” as a challenge, but I’m to a point where I can barely make it through what I’m given in one trip to four lines, none of which are crabs. Yes, it is campaign season. 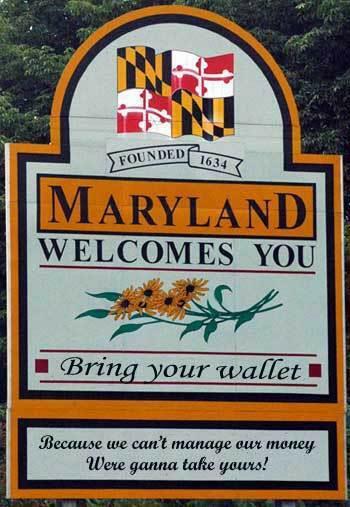 And since Wicomico County (and its media) are prominent there, you see a lot from our candidates. In an indication of what was to come, Boyd Rutherford was rather popular. The crowd of supporters surrounds Boyd Rutherford. I wonder if he will be here in 2021 as a candidate, and whether it will be to succeed his boss or upend the socialist? Smaller groups chatted with the more local and regional politicians. 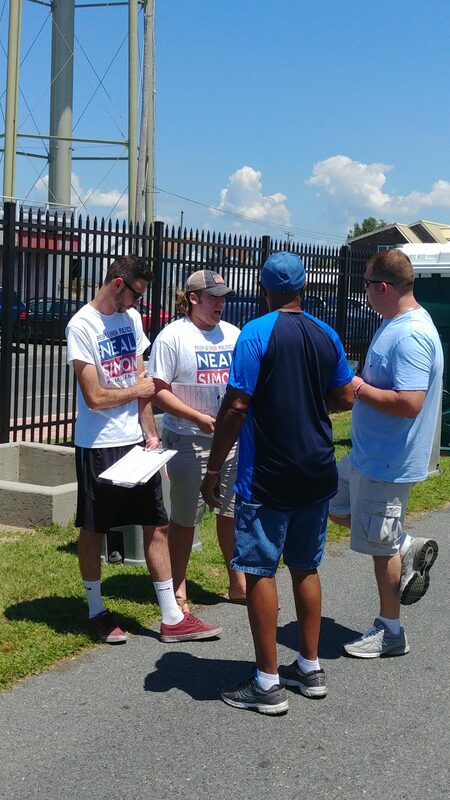 While Delegate Chris Adams (on the left in white) has one general election opponent for the two seats of District 37B, even that guy admits Adams and Johnny Mautz (who was also there) are prohibitive favorites to return to Annapolis. 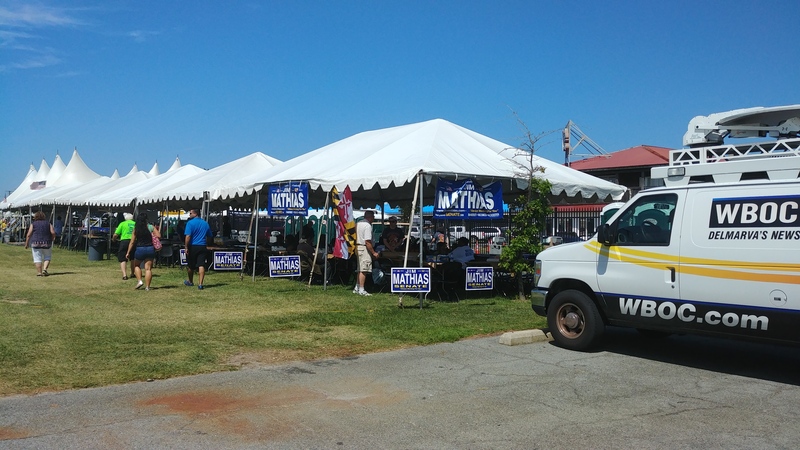 Because State Senator Jim Mathias had his own tent, the group at the main Democrat tent was smaller. It wasn’t exactly a blue wave. 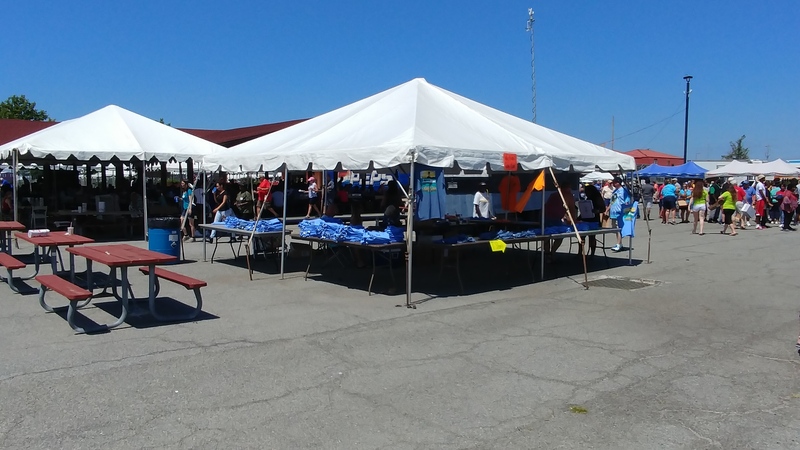 There were a number of business tents as usual, but they didn’t seem to draw a lot of interest. 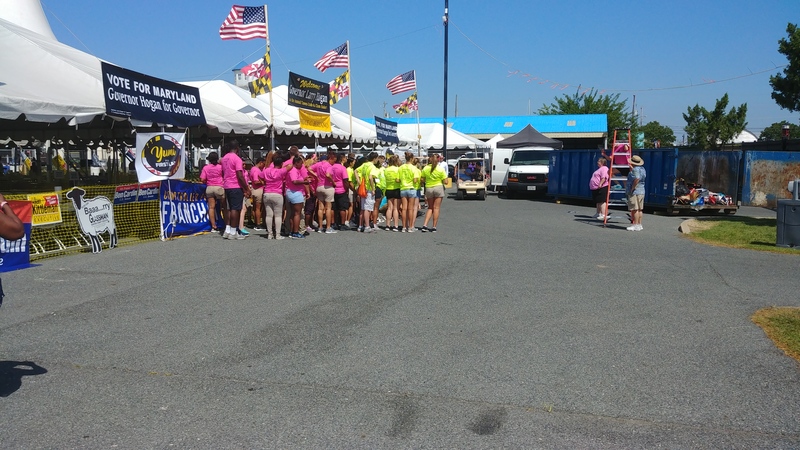 It seems anymore that the Tawes event is used as a company picnic of sorts. I’m going to return to the subject of business tents later as I wrap up, but in taking the photo I saw a person I wanted to meet. In fact, in speaking to him I found out he’s visited this site a time or two. This is one of the few times you’ll see someone to the right of me, if only in a visual sense. Actually, Neal Simon and I had a nice conversation. 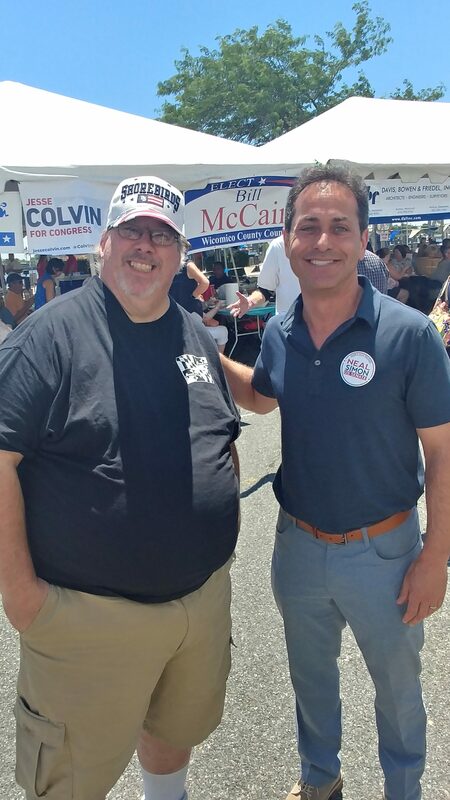 In speaking to Neil I found out he had gotten the Hogan signature I alluded to above at the event and that he was going to make the announcement about having the sufficient number of petition signatures the next day, which was yesterday. He just told me to keep it under my hat until the time came, which wasn’t a problem since I had other things to write on and it was pretty much a fait accompli anyway. Next up, though, is my favorite picture. You just gotta like Carol Frazier. 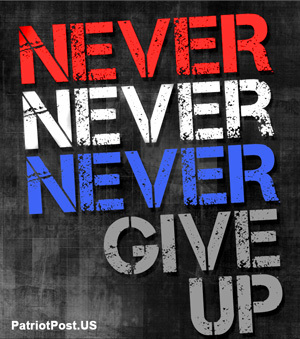 That’s all there is to it. It gives me a chance to say thanks to one of my biggest fans and supporters. And speaking of such, I had the opportunity to see someone I hadn’t seen since Turning the Tides five years ago. It’s just a shame I neglected to get a picture of Cecil County Council member Jackie Gregory, a longtime friend and supporter of monoblogue. Even Delegate Kathy Szeliga saw me and gave me a greeting hug. But when it comes to big fans and supporters of Tawes, I’m not sure anyone beats Bruce Bereano. If this guy ever stops coming, I suspect they could have Tawes in the Food Lion parking lot. For those politicians whose district doesn’t include the region, this is the place to hang out and eat. I think the Crab Trap idea was inspired by Bruce’s tent since people could see the political in-crowd live it up and wanted a version for their own. That guy in the center with his hands up – he’s the governor. 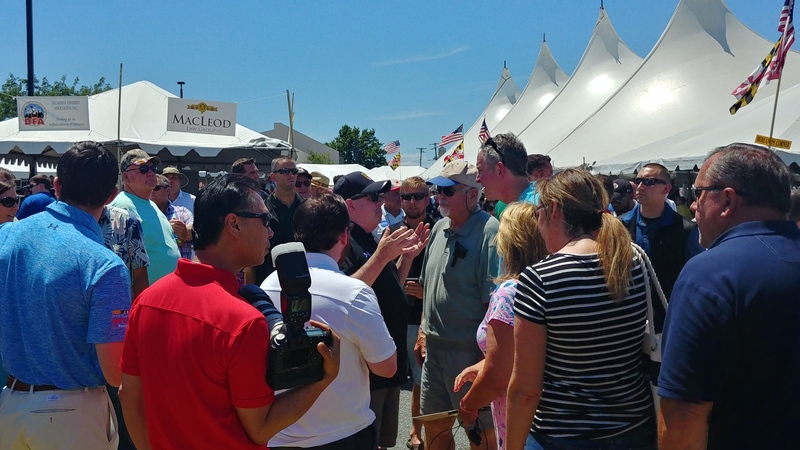 Larry Hogan always draws a crowd. 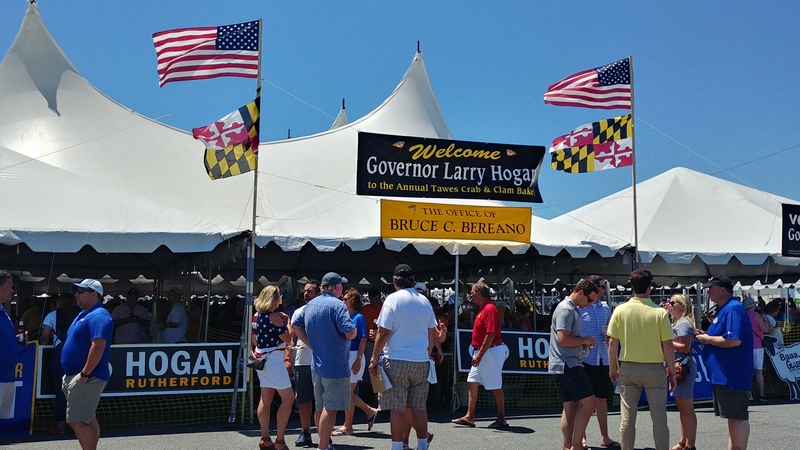 He may have pissed off various swaths of the Maryland electorate for various reasons, but the people don’t seem too upset at Governor Hogan here. Maybe a little bit of a smaller group circling him, but still significant. Even the host city welcomed him. 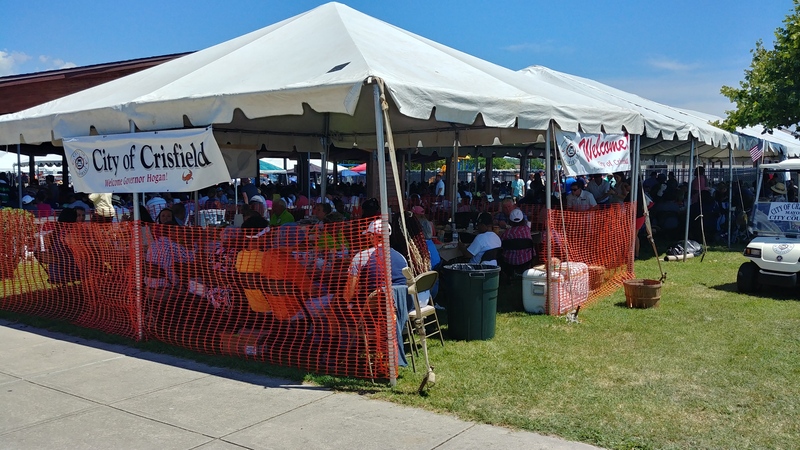 The City of Crisfield tent. Since everyone in town who could afford a ticket was down here anyway. I shouldn’t pick on Crisfield, since our former County Executive Rick Pollitt is their city manager. He stopped and said hello with a warm handshake. This is one of the strangest sights, although I’m sure it’s the way of the news business these days: talking to a camera on a tripod. It didn’t seem like the media was all over like before, but I saw all three local stations: WBOC channel 16 (and their associated FM radio station) and WMDT channel 47 out of Salisbury as well as WRDE channel 31 from Rehoboth Beach, Delaware – now that was a trip from one side of the peninsula to the other. I also saw channel 7, which I think is out of Washington, D.C. 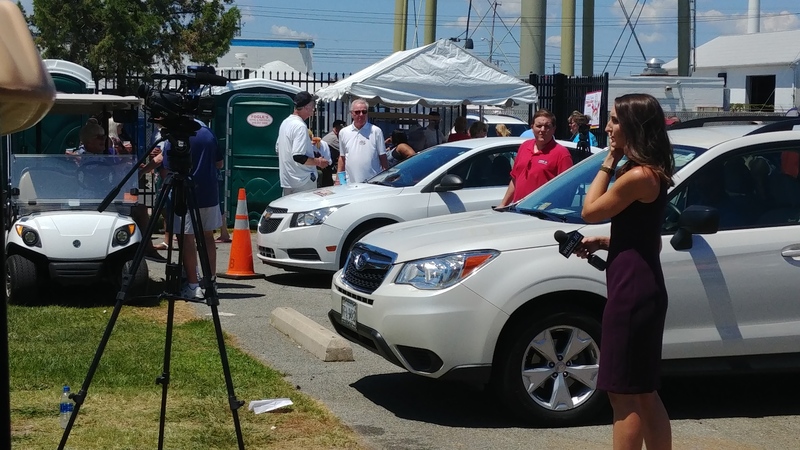 I know there were print and radio reporters as well, but they did their jobs in places I wasn’t, aside from WRDE who wanted to speak with Simon as I was talking to him. I took this photo a little after 2:00. The tall guy in black in the center, that’s Ben Jealous. He’s trying to take Hogan’s job. 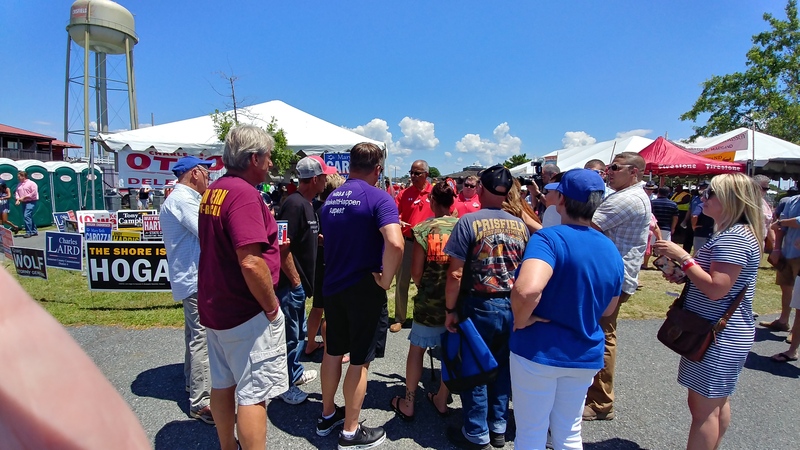 In the last three Democrat campaigns for governor (2006, 2010, 2014) I witnessed their favored or chosen gubernatorial candidate walk into Tawes surrounded by a posse of supporters clad in campaign shirts to help rouse support. 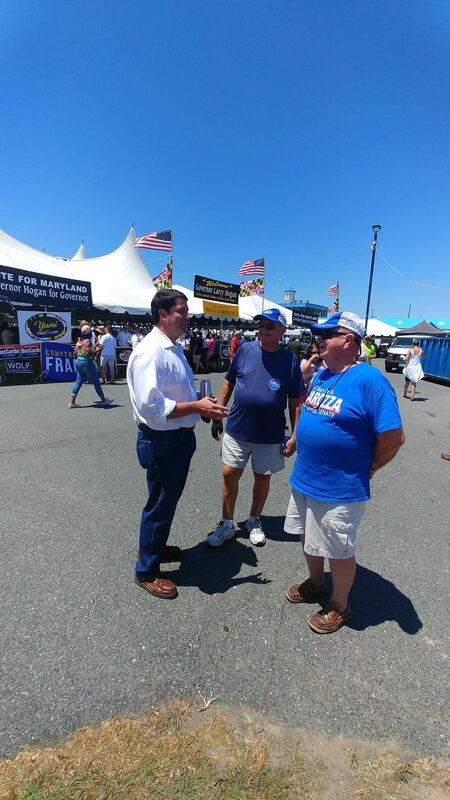 However, Anthony Brown skipped Tawes in 2014 since it was by then post-primary – his blue shirts came the year before. Regardless, the lack of campaign savvy on the Jealous team was very apparent – few supporters and not much engagement. It was almost like Ben used the event as a photo-op but the optics weren’t nearly as good as they should be in an area that’s heavily minority and majority Democrat. 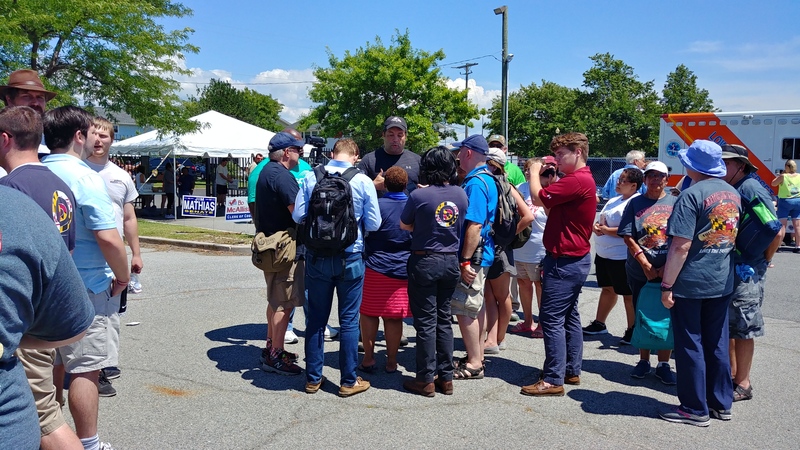 Even I quickly worked my way up to say hello and express a concern I had, as I did later to Governor Hogan. Finally, I’m glad I helped convince this guy into coming – or maybe he already made up his mind and likes to humor his supporters. Lieutenant Governor Boyd Rutherford on the left, U.S. Senate candidate Tony Campbell on the right. Wait a minute, I thought the GOP was exclusively for white people. Hopefully Tony followed a little bit of my advice: I told him to not just concentrate on the circle of tents in the back but go and speak to the people in the pavilions up front. And this is where my commentary on Tawes begins. 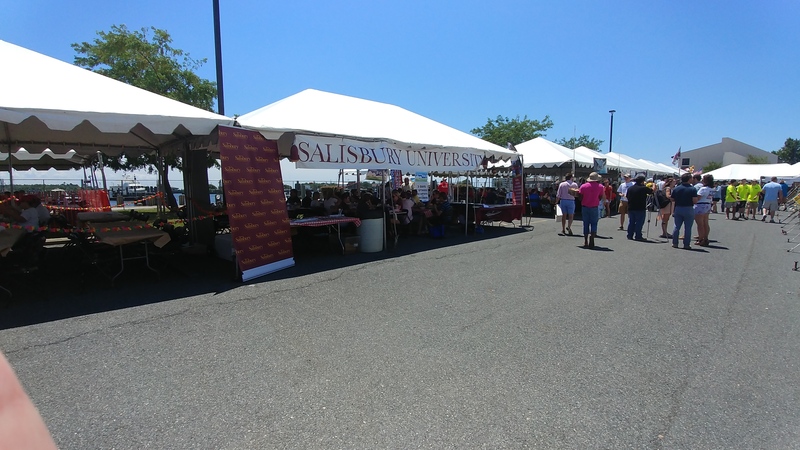 Earlier I alluded to the business tents, and in the last few years I’ve noticed it’s been pretty much the same businesses and entities are present at Tawes, and they bring a particular group of people to the event. Needless to say, the political entities also bring their own supporters and hangers-on as well. 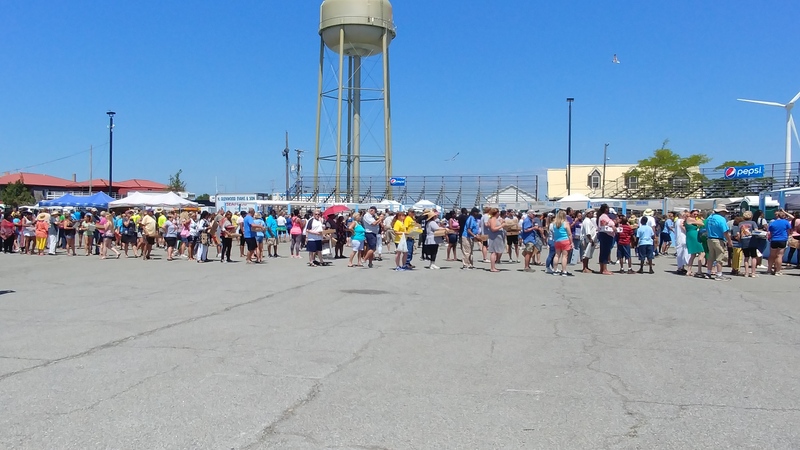 All of them stay pretty much within an area that’s bounded by the tents and the food lines up front. 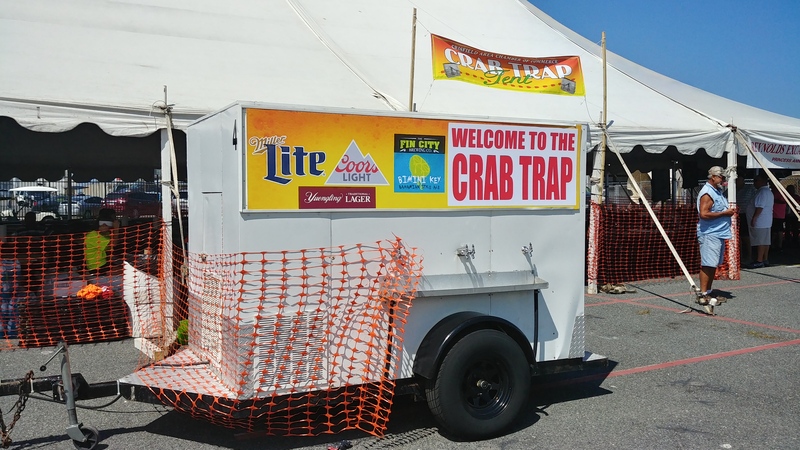 Of course, with the Crab Trap and addition of food runners over the last few years, Tawes has gotten to a point where one doesn’t have to come out from under the tent to partake in the event. 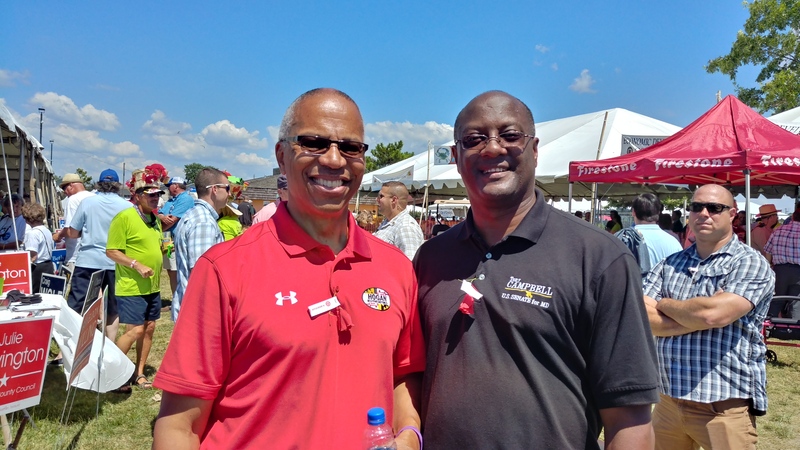 In my years doing the Tawes event, one of the benefits I enjoyed about it was the opportunity to speak with people from the other side. For the ten years I sat on the Central Committee and was active in the local Republican club, I obviously saw the local Republicans once or twice a month and my GOP friends from around the state twice a year at the convention. 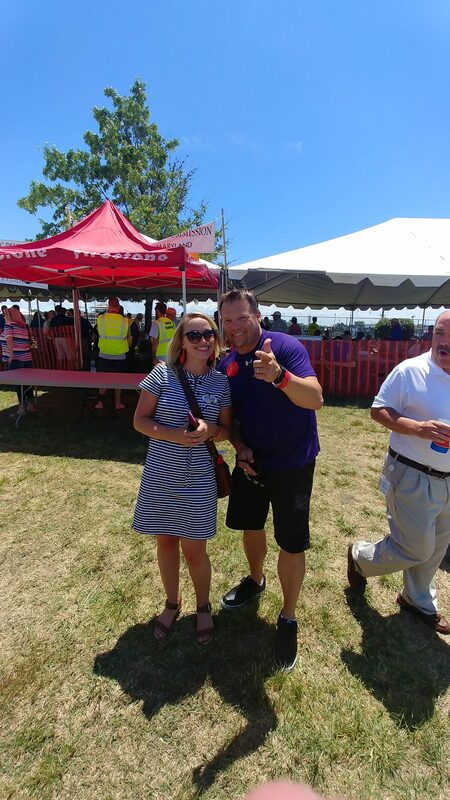 On the other hand, if you were a Democrat and a friend of mine (or a candidate with whom I wanted to place a face with the name, such as Jesse Colvin or Ben Jealous), just about the only time I got to see you was at Tawes. And even though I haven’t been nearly as active on the GOP side of late, the same still holds true on the Democrats’ side. For the most part I have no animus with them aside from their short-sighted political views. Unfortunately, there isn’t the mixing of people on a political level like there used to be and a similar phenomenon is beginning to take place at Tawes as groups become more insular. Surely there are people who never set foot outside the Crab Trap or Bereano tent from the time they arrived to the time they went home, and that’s sort of a shame. I have no idea on the attendance figure, but I think it may have been lower than in past years – on the other hand, there may have been people I never saw hiding in their safe spaces. Unfortunately for a person like me, 2019 looks to be a year dull as dishwater politically. 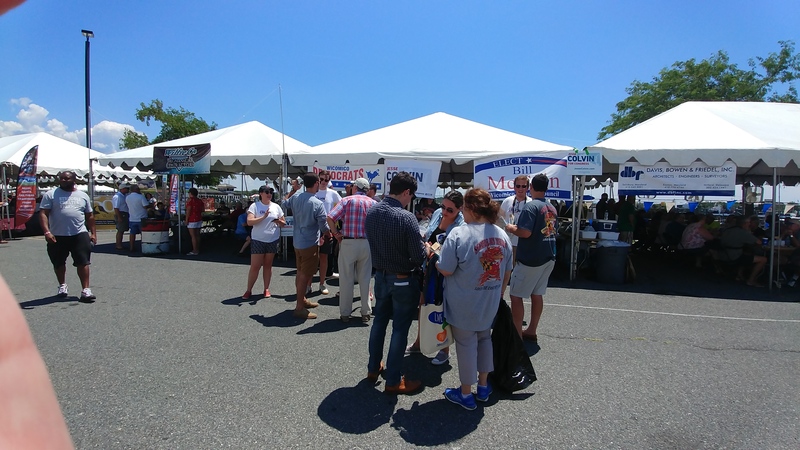 Sure, we may have some Presidential campaigns underway on the Democrat side but you don’t see a lot of them represented at Tawes and it would be a shock to see a Joe Biden, Elizabeth Warren, et. al. walk through those gates. 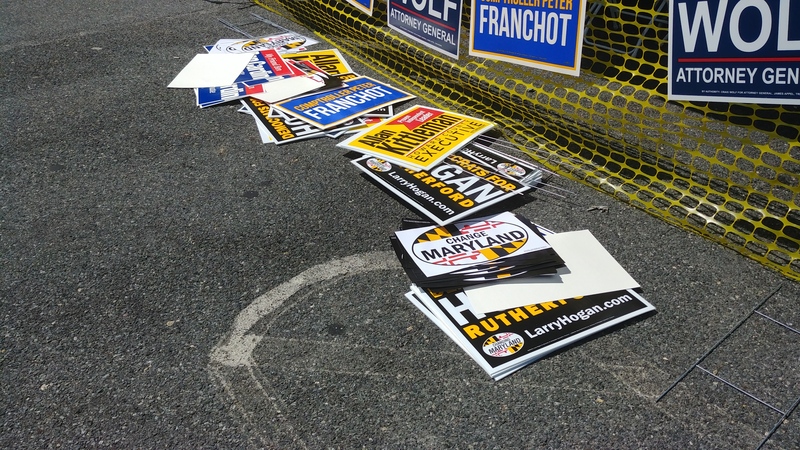 It’s not a statewide office election year, and in 2020 Maryland will have no Senate race. All that leaves is Congress, and whatever Democrat opts to step up. It’s pretty thin gruel. I don’t want to say the event is past its prime, but I suspect there are diminishing returns for a politician who isn’t statewide or represents an area outside the 37th or 38th District. To make things a little better there, we need to recall what we have in common, not what divides us.